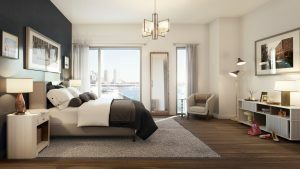 Design partner at the international creative studio II BY IV DESIGN, and principal interior designer for the ocean homes at PIER 4, Dan Menchions sat down with us to discuss the advantages of balancing glass windows with generous interior wall space. Offering the best of both worlds, PIER 4 provides residents with the ideal ratio of window to wall space, allowing them to add individual personality and flair to their home through décor and art, while at the same time enjoying the many benefits of sweeping waterfront views, and abundant natural light. Read on below for insights from Dan on why a balance between window and wall space is ideal, especially when living on the water. As a backdrop to one’s home, walls provide the perfect area to add character, visual interest and excitement. Through intentionally incorporating framed windows versus floor to ceiling glazing, the design team has allowed for opportunities to apply framed photos, a curated art collection, or to even anchor a sculpture. To further personalize the home, residents could apply special finishes such as textured plaster for a lavish look and feel, a wallcovering that plays off the beautiful glistening blue water, or a neutral hue of paint for a sophisticated and calm aesthetic. Wall surfaces provide a platform in which to cleverly plan each room and establish a focal point. Creating social zones, furnishings can be placed against walls and around windows or doors, entertainment solutions such as flat screen televisions and media units can be securely mounted, and accessories such as floating shelves, free standing shelves and full-length floor mirrors can be anchored. PIER 4’s premiere location provides residents with the convenience of city living in an environment set back on the water, separated from the bustling Seaport Boulevard. The architectural façade of white brick and glass that gracefully curves along the South Boston waterfront blocks views of surrounding neighbors and passers-by, while providing views of the water to each home. Each home’s framed, glass windows and the inherent wall space provide a canvas for added styling and privacy with the application of luxurious draperies. Targeting LEED Gold certification, each home at PIER 4 is energy efficient. The building’s solid insulating walls ensure each residence stays warm during the cooler months, and cool during the warmer months. PIER 4’s insulation also acts as a sound barrier from outdoor noises and neighbors, providing a suburban sense of calm in Boston’s urban environment. PIER 4’s strategically-designed windows enhance the all-important indoor and outdoor connectivity. 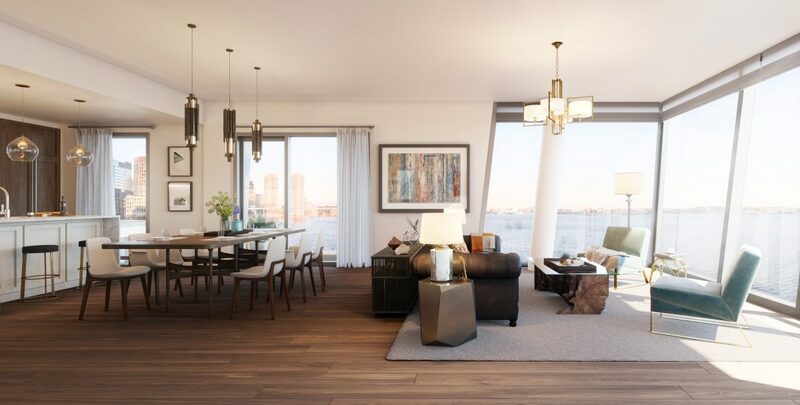 As the only Seaport residences surrounded by water on all three sides, PIER 4’s expansive framed windows allow natural light to easily permeate each home. Adding to the luxurious lifestyle of PIER 4, natural light visually expands and brightens a living space and improves its visual aesthetics, all while eliminating the need for artificial light. Natural light also has a positive effect on one’s mood and productivity. Internationally renowned, II BY IV DESIGN was founded in 1990 by partners Dan Menchions and Keith Rushbrook; both Dan and Keith dreamed of a creative firm that was deeply rooted in design and guided by a passion for constant innovation. Today the firm is distinguished by a balanced approach that captures the essence of each client’s vision rather than a predictable ‘signature’ look. Their staff of 50 can be found in a brick-and-beam industrial loft space in Toronto’s Liberty Village, in lower Manhattan’s fashionable TriBeCa district, as well as London’s Marylebone district. Renowned as industry leaders II BY IV DESIGN celebrates a widespread portfolio that demonstrates an expert interpretation of current and emerging consumer lifestyles, attitudes and expectations applied to the design of Retail, Hospitality, Condominium and Commercial Interiors, as well as Product design. Indicative of their success they have been credited with over 400 Design Awards, extensively published and recognized as Designers of the Year five times by various organizations both locally and abroad, as well as, declared one of the World’s Top 50 Retail Designers by Visual Merchandising and Store Design magazine.